Hay fever is painful enough for adults who understand the allergy, but it can be doubly difficult for kids, particularly when they experience symptoms during school hours. Coping skills are important for kids to learn because it teaches them to take an active role in their allergy management and also ensures that they can cope during school hours, when a parent is not present. If your child suffers from hay fever, it's important that teachers and relevant administrators at the school are made aware of it. This will ensure that your child receives the appropriate medications as needed and also has a support network during school hours. Although it's important to teach your child coping skills that he or she can apply, a hug from a teacher and kind words of support for your child's discomfort can make a real difference. It's important that your child doesn't feel isolated and 'different' from other children who don't suffer from hay fever. Ideally, your child's school will take an approach that involves educating everyone at school on allergies. For children, myths and confusion over what hay fever is and how it affects your child can be hurtful. A recent study has suggested that hay fever medications can cause students to drop down a letter grade in school. This problem is unfortunately due to the sedating effects of several hay fever drugs, which impacts memory and cognition. If possible, you should speak to your child's doctor about options for non-sedating hay fever medications. Lunch and snack breaks can be the best part of your child's day at school. It's a chance to take a break from indoor classes and have some fun outside. For children with hay fever, however, this time outside can exacerbate symptoms. Instead of being a source of pleasure, your child may begin to dread the outdoors. Make sure that your child has the appropriate medications for days when pollen counts are high and keep a good line of communication with your child's teachers, so that medications can be safely administered as needed. Constant sneezing, nose blowing and rubbing can leave your child with a raw and red nose. Ensure that your child has ample supplies of tissues-you can buy several smaller packets that you child can conveniently keep in his or her pockets. A little pot of Vaseline is also useful. Your child can dab a little under his or her nose to provide a lubricating barrier to the constant irritation from blowing and rubbing. Fostering confidence in a child who suffers from hay fever is important. Children who regularly deal with hay fever symptoms may wonder, 'why me?' They may also feel helpless to participate in their treatment and may suffer from embarrassment and social isolation when they worry about playing outdoors, for example. 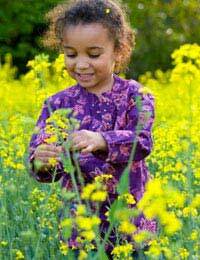 The first step in managing hay fever is to obtain a treatment plan from your child's doctor. Yet, even with the best treatments symptoms may not disappear and may still plague your child, albeit to a lesser degree. If your child doesn't know other children who deal with hay fever, it can help to reassure him or her that hay fever is common and that your child is not alone in the struggle to handle hay fever symptoms. You can also compliment your child on his or her strength in coping and reflect on your child's frustration and discomfort. It's important that your child feels understood. Also remember to focus on the positive aspects of treatment. Telling your child, 'I'm so proud of how you have been looking after yourself at school' and 'I'm glad you told your teacher that you needed your nasal spray' shows your appreciation of your child's ability to cope. Untreated, hay fever symptoms are a painful burden for a child to face during school hours. Your child may feel isolated from other kids and may struggle without parental support. Exam marks and other forms of school performance may also be adversely affected. Fortunately, you can teach your child coping skills that will help him or her to handle hay fever symptoms and function well during school hours. Instead of grumbling about hay fever symptoms, your child can get back to grumbling about homework!